Anthony Rae for FOE 9th February 2015 The biggest issue for Calderdale Friends of the Earth in 2015 is to make progress tackling the increasingly serious issue of climate change, not only here in the UK, but internationally as well. Would you like to join in and help us to accomplish this together? In my previous article I wrote about the ‘Road from Lima to Paris, via Calderdale and London’. After the last UN climate summit in December last year (in Lima) it’s now critical that we influence the Paris conference in December 2015 because those are the negotiations at which a new global treaty and emission targets need to be agreed. Current measures to prevent the effects of climate change are inadequate to control global temperature rise so we must carry on pushing for a deal that is tough but fair. The way to do this is through a campaign which has strong roots in every part of the country (that’s the Calderdale bit), and to lobby the UK government (in London) to do everything it can to bring down CO2 emissions and find a way through to low carbon prosperity. There’s a real urgency about this because – as the science demonstrates – we’re running out of time. We can’t do this on our own but through The Climate Coalition that has brought together over 100 organisations in the UK , with more than 11 million members and a shared concern and dedication to action on climate change, we’ll have much more clout. Its new campaign was launched today 9th February 2015 and it will carry on, building momentum all the way to the Paris conference. It’s open to anyone and everyone, individuals as well as organisations- and not just dedicated environmental campaigners; there’s Oxfam, RSPB, and the WI in there as well! – as you can see here. If tackling climate change is good for your community, and good for your organisation or business, public or private – you can join in. 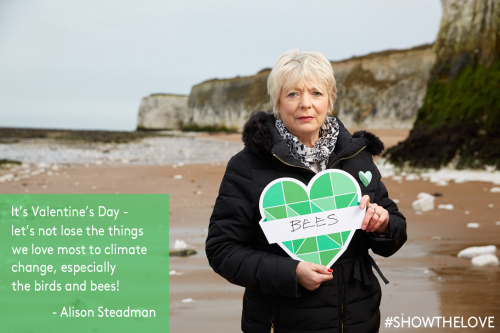 This very inclusive approach is reflected in the campaign’s slogan: ‘For the Love of …’ It asks people to think about what they personally hold dear – no matter what, large or small – which may be threatened by rising carbon emissions: so ‘don’t lose what you love to climate change’. For the last year members of the public have been contributing what this means to them; read some of their stories (with more here). In Calderdale shouldn’t we be concerned about the 10,000 households – and up to half our older people – affected by fuel poverty, who can’t keep warm enough in winter: For the love of Calderdale families in cold houses? Or about communities in the Upper Calder Valley struck by flooding in recent years: For the love of homes and businesses, threatened by flood? There are many more examples of precious things affected by climate change, some well known, others personal to you. – there’s a moving film featuring some famous people. View it here. – You can send a Valentine’s Card to someone telling them about the campaign. Friends of the Earth will be sending out quite a few. 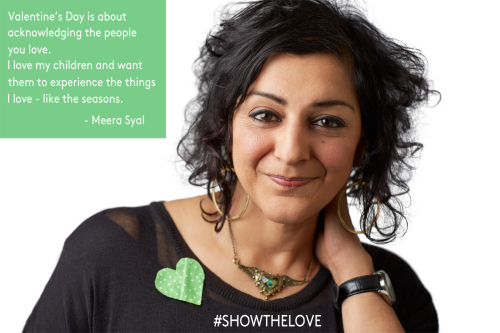 – You can make, wear and share a green Valentine’s Day heart. – Follow ‘For the Love of” on Twitter and Facebook. – If you’re a group organiser, you can view the Resource Pack for the event. ‘For The Love Of…’ is being rolled out in installments via social media but that does not preclude you from having promotional events such as: coffee morning, craft session, nature walk, etc at anytime this year. 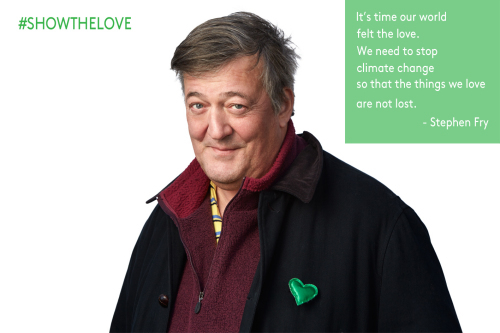 Wearing a green heart badge is a good way to demonstrate your support and a conversation piece to spread the message. * To seek a strong, legally binding, global climate deal which limits temperature rises to 2°C which is fair for the world’s poorest. * To work together across party lines to agree carbon budgets in accordance with the Climate Change Act. In our next post we’ll explain more about why these pledges are just right, but you can see that they stretch to cover action not just at the global level but also in the UK too, which means that they will be relevant to Calderdale as well. And next? A most important date for your diary is Wednesday 17th June in London – so a month after the Election, and when we hope any sorting out of who has won and what they propose to do has been completed; please note: the Climate Coalition is non-party political, and is seeking the support of all parties – the campaign will be lobbying the new government and all the MPs elected in May to ask them to commit to making these pledges happen. Calderdale Friends of the Earth will be organising a trip to London on that day. Can you join us? And after London in June there’ll be actions we can all take to urge world leaders, and our government, to tackle climate change in 2015.